Celebrate this year’s May Day with local flowers from Finding Eminence Farm. Never heard of it? Think this is just another made-up holiday that florists and card companies create in order to make more money? WELL YOU’RE WRONG. (But we are still interested in some of your money.) May Day has its roots as a pagan, pre-Christian tradition. Over the years, the day evolved into a celebration of the coming of spring, often through the giving of flowers (awwwww!). In the U.S. in the spring of 1886 some 200,000 U.S. workers were like, “We don’t want to work so much, you greedy capitalists!” so they went on strike in order to gain an 8-hour workday. Three years later the International Socialist Conference declared May 1st “International Workers’ Day,” which meant that one hundred years later, in the midst of the rampant fear of communism during the Cold War, Dwight Eisenhower felt the need to declare it “Loyalty Day” in the U.S. so everyone remembered what side their bread was actually buttered on. A holiday with this much history should not be allowed to wither and die. WE WANT MAY DAY BACK, YA’LL. Whichever version of May Day you want to celebrate, you can do it with fresh, local flowers from our farm. So whether it’s a bouquet for loved ones, a bouquet for your Socialist neighbors, or a bouquet for ‘Merica, we have you covered. Flower farmers don’t get 8 hour work days, but at least our long hours mean beautiful blooms for you and yours. 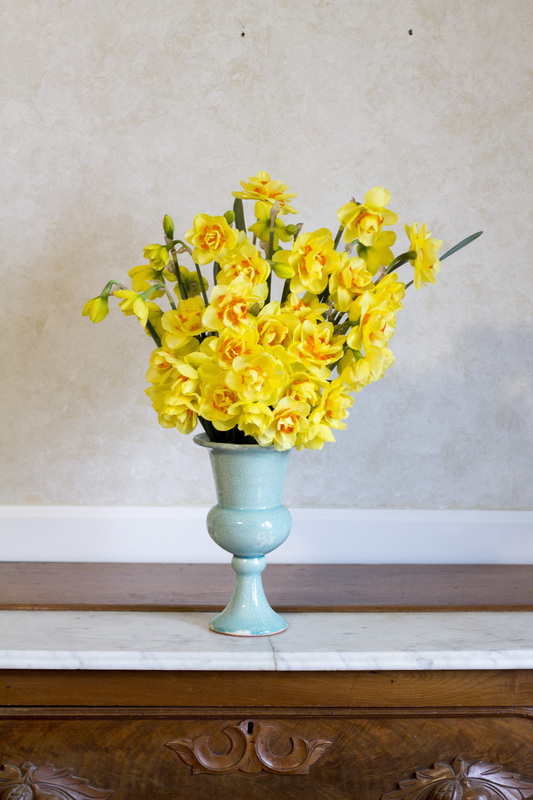 Each posey has 10 White Lion or Tahiti double bloom daffodil stems and are placed in a pint sized ball jar that is not only cutesy, but makes it super easy to hand deliver. Posies can be picked up on the farm for $10.00 a bouquet. Need it delivered to one location so you can hand deliver your flowers? No problem, as long as you have your bouquets delivered to one location it’s just a flat $10.00 delivery fee (For example, five bouquets delivered to your place of work is $50.00 in posies + $10.00 delivery fee = $60.00). Want us to deliver your posies to separate locations? Send us an email and we’ll work something out. Posies can be picked up on the farm Friday, April 29th from 6:00 p.m. – 8:00 p.m. and Saturday, April 30th 9:00 a.m. – 10:00 a.m. Deliveries will occur Friday, April 29th between 10:00 a.m. – Noon. Need something special for Mother’s Day? Because let’s be real, Mother’s day isn’t just about Moms, it’s about all the special women in your life who have put up with all of your shennanigans for years. Custom arrangements start at $45.00 and will be delivered Friday, May 6th, or Saturday, May 7th. Our French tulips, Galilee anemones, and Elegance sweet peas will be mixed in with other beautiful spring blooms to create a unique gift. To include a special message in your arrangement and to choose the date and time of delivery, be sure to write a note during the check out process requesting these items. Small bouquets are around 4″ wide and 5″ – 6″ tall. Medium bouquets are around 10″ wide and 9″-10″ tall. Large bouquets are 12″-14″ tall and 10″-11″ wide. Each bouquet comes with a unique, heirloom vase.